While we went through a rather dramatic emergency cesarean section when the elder one was born, the birth of my younger son was rather 'uneventful', although his was also a cesarean birth. I remembered when he was 3 days overdue I was still hoping for a natural birth. I had this thought that I would be a 'lesser mother' if my child is not able to arrive to this world via the 'proper channel'. My doctor had advised me not to wait any longer than the next 3 days, and he hinted that I would probably have to face a double whammy if I insisted to wait for a natural birth.Those words have finally convinced me that I should go for another cesarean section. We decided to wait till the ultimatum date for the operation plus it was considered a 'good' date, since it is so easy to remember 21-12-2001! It was also such good timing as the three of us were able to bring home on Christmas day what turns out to be our fountain of joy. Since that day, he has given us so much joy and laughter. 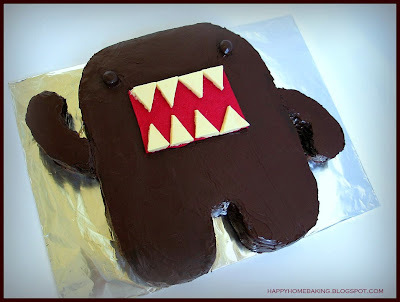 It was a couple of weeks ago when we were at their cousins' place, my boy pointed to a Domo Kun flush toy and told me he would like me to bake him a Domo Kun cake. You may not be familiar with this hilarious-looking creature, even for me (I do keep myself very up to date with the latest cartoon characters and toys!) I have only seen it on tv once. It was a short animation and was aired to fill the gaps between programmes. If you are interested, you can read more about this weired looking creature here. 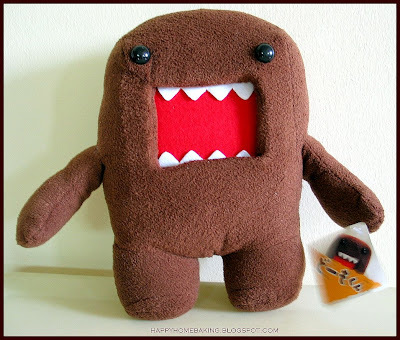 Fortunately, Domo has got very simple features...two popping eyes and a humongous mouth with sharp pointed teeth. Since it would be my very first attempt to make a 3-D cake, I told my boy I would give it a try, although he better be prepared that if things don't work out, we would have to go for plan B...ie to get those ready-made cake from the nearby bakery shop. Since I do not have a large pan, I made the cake by baking two separate sheets of sponge layer. I drew a template on a baking paper and used it as a guide to cut out the sponge cake. The sponge layers were then filled with whipping cream and peach slices (according to the boy's request!). The surface was coated with a thin layer of chocolate ganache and I took two chocolate-coated coffee beans to make the eyes. I melted some white chocolate and added a drop of food colouring to form the mouth. The teeth were simply cut out from a bar of white chocolates. This must be the ugliest and yet most adorable cake I have ever made! It is no surprise that my boy received a Domo Kun flush toy on his birthday. I compared it with the cake I made, and I realised that I have made the teeth too huge and the entire mouth should have been sunken. Anyway, my boy was very happy with the result, to him it looked perfect...and the cake grabbed the most paparazzi attention during the party! 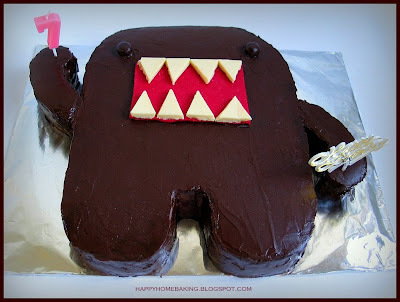 I like the Domo cake. It is so original compared to when you purchased from the bakery. Happy belated birthday to your 2nd boy. Wishing you and your family a splendid festive season and a good start to Year 2009! HHB, I could feel you joy in the posting. You are such a wonderful mummy and go all the way to fulfil the boy's wish! Happy Belated Birthday to your boy! And Merry X'mas to you & your family! What a beautiful cake you have made!! I can understand your joy after you have made the cake. It really looked like the real thing! HHB, the cake is simply so cute! You are such a great mom! Here's wishing you and your family a merry merry xmas! I hope that in time to come when i become a mother, i will be like you too! Kid's birthday cakes are always cartoon looking .. no matter how far the cake differs from the original, as long as our kids are happy, we as mothers will be happy. Reading this post brought a smile... wonderful cake and I applaud your effort. Happy Blated Bday to your boy. Another masterpiece. You are so creative! The cake is unique and priceless, it is filled with love from a mum. Very cute cake! Lovely story. :) Happy birthday to your boy! Very cute cake, priceless indeed. I do not know this particular character but a check with my nephew and he's able to identify it instantly, in fact he envies your son for having such a nice cake. As the year draws to an end, I must say a big Thank You to you for being so generous in sharing your baking experience. I am guilty of sponging off you, have been inspired by your posts and have learnt so much from you. Here's wishing you and your family A Blessed Christmas and a Happy New Year. such a cute cake! LOL... kids nowadays have weird taste dun they? HHB, wish you and yr family and merry christmas and happy 2009! Happy belated Birthday to your boy! The cake looks lovely. Happy Xmas to you and your loved ones. Now u cannot argue with me when I say u deserve Mother-of-the-Year Award hor! happy belated birthday to your son, what a cute looking birthday cake! happy holidays to you too. What a cute cake! Happy belated birthday to your boy! Hi Jon, happy belated birthday to your boy too! just wondering, can you bake a cake like this for me? :) about 2kg! Hi, as mentioned in my post, I drew a template on a baking paper and used it as a guide to cut out the sponge cake. I melted some white chocolate and added a drop of food colouring to form the mouth. Spread the melted chocolate and leave it to harden and trim the sides. The teeth were simply cut out from a bar of white chocolates and placed/stick on the mouth with some melted chocolates. For the ganache I melt 200g dark chocolate with 1 cup heavy cream. Hope this helps. Thank you for your reply! Just a quick clarification... Did you cut out the baking paper and put it on the cake as a guide to cut out the shape? I'm so sorry I didn't get you 1st time round. Hi Ange, yes that's right, I used baking paper as the template, place it on the sponge cake to cut out the shape. The hands are actually separate parts from the body as my oven is too small(only 20L) to accommodate the whole shape in one piece. Hi, I baked this cake using a swiss roll sponge cake recipe (see under my cake recipes). I baked two separate sponge layers. I cut out a paper template and used it as a guide, I did not measure the size. You can make the cake according to the size you want. oh, thanks alot for the help :) anyway if i wanna make a coffee fav whip cream. how do i make it? Hi, I am sorry, I have not tried making coffee flavoured whip cream so I am not able to comment. I chocolate ganache is left to cool off and then used immediately. The frosted cake is then kept in the fridge. Do not store the ganache in the fridge as it will harden. 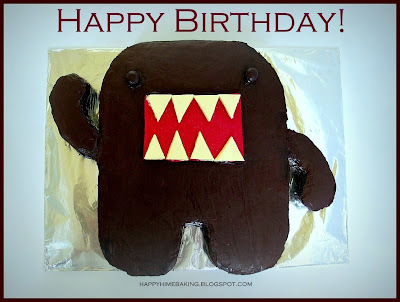 The domokun cake is so cute!! My son was happily staying inside my womb too when the date is almost due. My gynae would not want to wait any longer and decided to do a induce birth 3 days before the estimated delivery date haha. The reason why is I am small size and my son was quite big from the scanning - 3.4kg. But the machine seems to be off as his birth weight is 3.24kg.